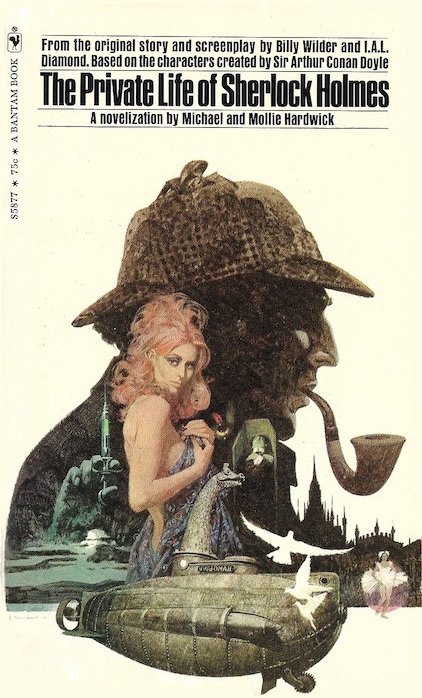 Novelization for my all time favorite Sherlock Holmes film, The Private Life of Sherlock Holmes (1970), starring Robert Stephens as Holmes and Colin Blakely as Watson. "...matters of a delicate and sometimes scandalous nature..."
At last revealed––some adventures of Sherlock Holmes that even Dr. Watson did not dare to publish during his lifetime! Fifty years after his death, a bank vault in London is opened to reveal new material about the most fascinating fictional detective of all time. In their hilarious and brilliant new film, Billy Wilder and I.A.L. Diamond have recreated the world of Sherlock Holmes in an adventure never before imagined. What you don't know about Sherlock Holmes has made a great motion picture...and a delightful new novel.